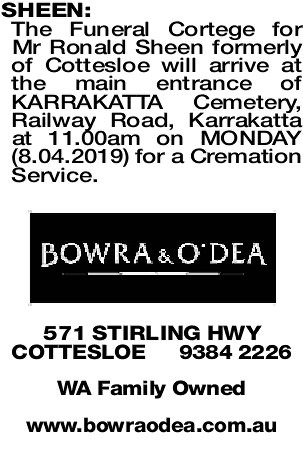 The Funeral Cortege for Mr Ronald Sheen formerly of Cottesloe will arrive at the main entrance of KARRAKATTA Cemetery, Railway Road, Karrakatta at 11.00am on MONDAY (8.04.2019) for a Cremation Service. 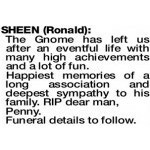 The Gnome has left us after an eventful life with many high achievements and a lot of fun. Devoted father of Peter. Will be sadly missed. 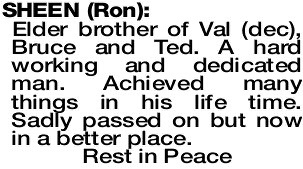 Rest peacefully Dad. 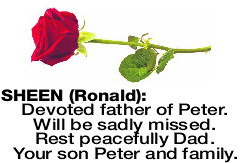 Your son Peter and family. 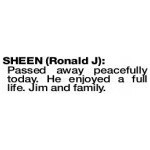 SHEEN RONALD J Passed away peacefully today. He enjoyed a full life. Jim and family. 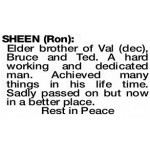 Elder brother of Val (dec), Bruce and Ted. A hard working and dedicated man. Achieved many things in his life time. 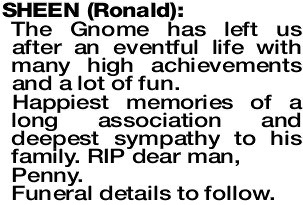 Sadly passed on but now in a better place. 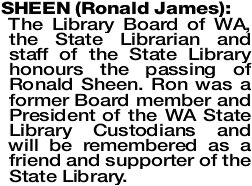 SHEEN RONALD JAMES The Library Board of WA, the State Librarian and staff of the State Library honours the passing of Ronald Sheen. 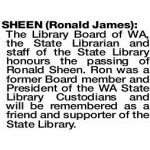 Ron was a former Board member and President of the WA State Library Custodians and will be remembered as a friend and supporter of the State Library. Fond memories of dear Ron and our days at New Norcia. Now rest in peace old friend. 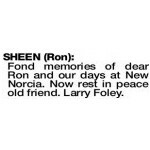 Larry Foley. 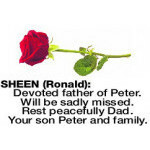 SHEEN RONALD Ron was a very close friend and business partner for many years. He has left us with wonderful memories. Gnome was a pioneer in many fields. Sympathy to Jim, Anne, Kay, Peter and also to Penny.